I need to make the game’s primary pipeline, which includes proper timing for when the world is generated and dismantled — when the player is playing or in the menu. From plyer’s perspective, this comes down to having menus, world loading, pause screen, transitions, etc. So that’s basically how I am approaching this — UI with implication that the underlying framework is needed first. First of all, I need to do some preliminary HUD work. 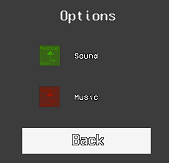 I currently have a HUD systems, but I am going to convert it into a UI system and just have HUD elements be same sort of UI windows that I can open and close as needed with all the callbacks to control them nicely. I really don’t want to keep two systems that basically do the same. Not that it actually pauses anything. So I need to make a game state for this, and have all the systems wired to receive pause and unpaused events so they can handle anything they need, such as cursor capturing or music changing. There’s no real “restart”, because I have only one level, so it will just restart the same world. I don’t really have any “continue” either, so it will just restart the world. I have a bunch of debug stuff for quickly restarting and just starting the game directly into the level, and I really want to keep it all for quick testing needs, so I’m adjusting as needed. Of course, art for all of this is pending. I will also cover exact content of each menu, like options, separately. A lot of this will be towards the end of the project when I know exactly what is needed and I am basically wrapping up. And this makes my main UI pipeline more or less complete. This isn’t a long entry, but this is an important part. UI is hard. Keeping the game stateful and UI organized is way harder than it sounds unless one makes sure to have a framework ready and establishes a pipeline all systems follow and separates UI from game logic well. Otherwise, bugs and issue will just continuously keep cropping up. At some point, cost to add or change UI will just be unjustifiable.